Kareyce Fotso started performing as a backing vocalist in the clubs of Yaoundé in Cameroon. While in France for a residency ("Visa pour la Création"), she worked under artistic direction of François Kokelaere (former manager of the National Ensemble of Guinean Percussions). This encounter gave birth to a solo show, Kareyce playing guitar and percussions while singing. Her second album "Mokte" has been released in April 2014 on Belgian label Contre-Jour. 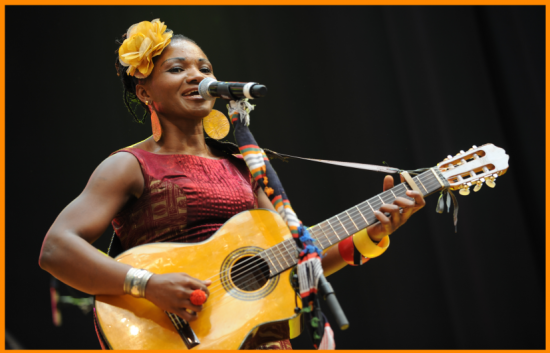 She will perform at Womex 2014 on October 25th.